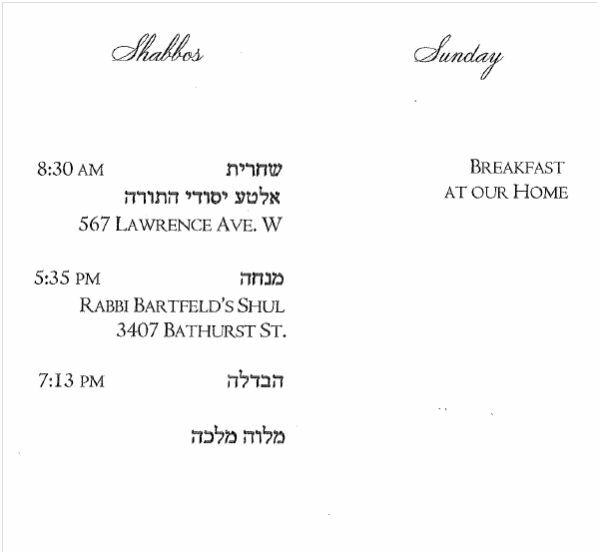 Last week at this time I was in Toronto for Avrohom – Avrumi Perl’s bar Mitzvah. Great weekend and the following is my diary with some Kotzker Torah. Departure date. I was trying to leave before 3:00 PM for my drive to Toronto for Avrumi Perl’s Bar Mitzvah. Too much drama with my customers and I ended up leaving at 5:00 PM. My mother, Bubbi Jean, and the two Chase girls were in the car with me for the trip, Penina Leah and Sarah. Hit rush hour traffic and took an extra 45 minutes. I told over Yehuda Avneir’s inspirational stories from his speech at the 2008 Lubavitch Shilach convention, the story that Chazzen Silber told to David Willner the Kiddush Hashem his grandchildren are doing in the IDF. I listened to two classes on tape. My son- in-law burned them for me last week when I was in Indianapolis. I heard Eli Mansour and Zacharya Wallerstein. Both were excellent, both talked about faith and belief in God – Emunah and Bitachon. Eli Mansour talked how we think one thing and the opposite happens. Hamen set up a tree 50 Amos high for Mordechai. Hamen was on top of the world, and within a few days he was hanging from the tree. Zecharya Wallerstein spoke that we cannot live in the past and dwell on our sins. We have to always look forward. Zecharya Wallerstein quoted a Midrash that said when Hamen was walking home at the height of his glory; he stopped into a Yeshiva to see what the students were learning. They were learning the laws of the incense that the Cohen burned on the alter, the laws of Kemitzah. Hamen goes homes and tells his family that despite the fact that there is a decree to kill all Jews and that Hamen was at the peak of power and influence, the Jews would prevail and all is lost. The meaning of this Midrash per Zacharya Wallenstein is that Hamen expected the students to be studying the laws of Kiddush Hashem, how to die sanctifying Gods name due to their impending destruction at the hands of Hamen and Achesveirosh. Yet the students were looking toward the future when the Temple would be rebuilt in Jerusalem. They looked forward and not back. They did not beg Hamen for mercy. They ignored Hamen as if Hamen was meaningless. This is the concept of Bitachon, everything is in God’s hands and Hamen is a puppet. He cannot do anything unless God wants it to happen. This is the message of the Midrash. Arrived in Toronto at 3:00 AM. Woke up at 10:00 AM. Did not realize it was really 11:00 AM. Spoke to work and arrived at the boat Synagogue at 11:30 AM, hoping to catch a Minyan. It was then that I realized how late it was. I went up the Amud to lead the prayer services. We had 4 people praying with us, not a Minyan, however, we davened as if we had a MInyan, including saying Kiddusha out loud. We read from the Torah and davened Musaf together. It was highly satisfying for me. After the prayer services, I spoke about my joy at davening with other Jews at this late hour, as we all felt connected. I told over the story of the Kotzker when he was in yeshiva in Zamusz. One morning when the Kotzker was late in praying morning services, the dean of the school, Rabbi Yosef Hochgalenter 1740 -1807, chased the Kotzker to the Synagogue. The Kotzker bolted the doors and davened. At Shul I saw Rabbi Yosef Spiro, my roommate from Ner Yisroel in Toronto. He is not well. He needs a kidney transplant. I asked him for a D’var Halalch. He told me about the law of “C’dei Achelas Peras”, that to be considered a valid Acelah -“eating” for Jewish law, the complete eating has to be within a certain time limit called “C’dei Achelas Peras” . Rabbi Spiro said that there is a disagreement between the Mishna Berurah and the Pri Migadim or the Magan Avrohom that to say the grace after meals one has to have an Acelah. The question is what happens if one eats less than the amount that is considered an Aceliah, but one is satisfied, does he have to say grace after meals. The Mishna Berurah says no and the Pri Migadim says yes. One of the 4 people praying with us is from the old city of Jerusalem was Goldberg, and is good friends with Rabbi Yosef Soloveichik, “Joe Brisker”. After Shul, I received a call from work that highly agitated me. I raised my voice at a customer over the phone. Afterwards, I went to Pesach Chase’s house for lunch and talk. My mother, my sister, Karen, and Karen’s daughter were there. We had a great time. We told over the family stories and they were just as funny as when I heard them the first time. I had to go to the bank to take care of something and just made it back just in time to get ready for Shabbos. Arrived to Tzi’vi and Chaim Perl’s house for the Friday night meal. It was great seeing all of the family. The kids are growing up. Tzi’vi and Chaim’s kids were there, including their married son; Moshe Yaakov and Miriam and their baby, Yitzchok and Bracha’s and kids were there from New York including their two older yeshiva boys; Mayer and Chana and kid; Elisheva and Yossi and their daughter, and Sholem Chase. I sat next to Pesach, Esther, and my mother. Great food, everything was home made. Great speeches. Went back to the place I was staying. Could not sleep as I was still agitated from before Shabbos. Schmoozed with Karen and my mother. Arrived at Synagogue at 10:00 AM, a little late, as the prayer services started at 8:30 AM. The Synagogue was on Lawrence Avenue at the old Yesodai Torah Shul. It was established in the 1950’s by Holocaust survivors who came from Hungary. 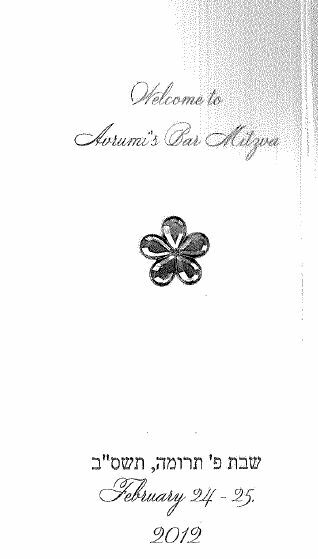 The Bar Mitzvah boy is named after his great – grandfather, Avrohom Friedman, who prayed at the Synagogue. Avrohom Friedman owned a wholesale dry goods warehouse in Toronto, supplying small grocery stores. 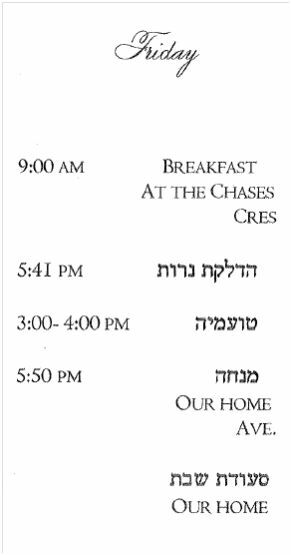 Mr. Friedman closed his place of business at noon every Friday to prepare for Shabbos, learn, and make it to Shul early. Avrumi Perl read from the Torah like poetry. His leining was clear, loud, with every word pronounced with the Trop perfect. I only heard one missed trop sound. I sat next to a Mr. Blumenfeld. Mr. Blumenfeld is married to a Kaiser. I went to Yeshiva with his wife’s brother, Mike Kaiser. Mr. Blumenfeld ’s father came to America with his sister in 1939. Unfortunately the rest of his family could not get out of Europe and they perished. His father was on General Douglas Macarthur’s staff in the Philippines during World War II. Mr. Blumenfeld said that his father worshipped General Macarthur. His father got his college degree on the GI bill. The Kiddush was lively. I asked Helen Friedmen for a Brocha. Helen Friedman is Esther Chase’s mother and the great-grandmother of Avrumi. I talked to the Chaim Perl’s siblings and told them that I met their first cousin, David Willner. I told them the great work David Willner is doing with Rabbi Barnei Selevan. I met a Mr. Eckstein who was visiting from Brooklyn, NY. Eckstein is in the insurance business. We began to play Jewish Geography and I mentioned that I met a Joseph Eckstein from Queens last summer in LA at the ice cream store on Robertson. Eckstein tells me that Joseph Eckstein is his brother. Joseph Eckstein’s father-in-law ate by my cousins in Queens this past Rosh Hashana. Small world. After the meal went back to Tzi’vi and Chaim’s house for the rest of the afternoon. I was asked to speak. I read two great stories of the greatness of the Kotzker Rebbe. Kotzker Story #1 – The Chidushai Harim’s Manuscript. Kotzker Story #2 – The Avnei Nezer’s Pshat in a Rambam. After Shabbos slept for an hour, then went back to Tzi’vi and Chaim’s house for more food and talk. Went to the boat synagogue for morning prayers. The person leading the prayers was Yehuda Berkowitz. I blogged about him earlier. Yehuda Berkowitz is from Har Nof, Israel and ate over my house a few weeks earlier on a Friday night. Yehuda Berkowitz left Chicago and I felt bad that he left Chicago without my donation. I gave him what I was planning to give him. Drove back to Chicago in less than 8.5 hours.